Loki poses with a Waldorf Streichfett synthesizer in a beautifully composed photo. From Nicky Skolagava via the Facebook group Synthesizer Freaks. 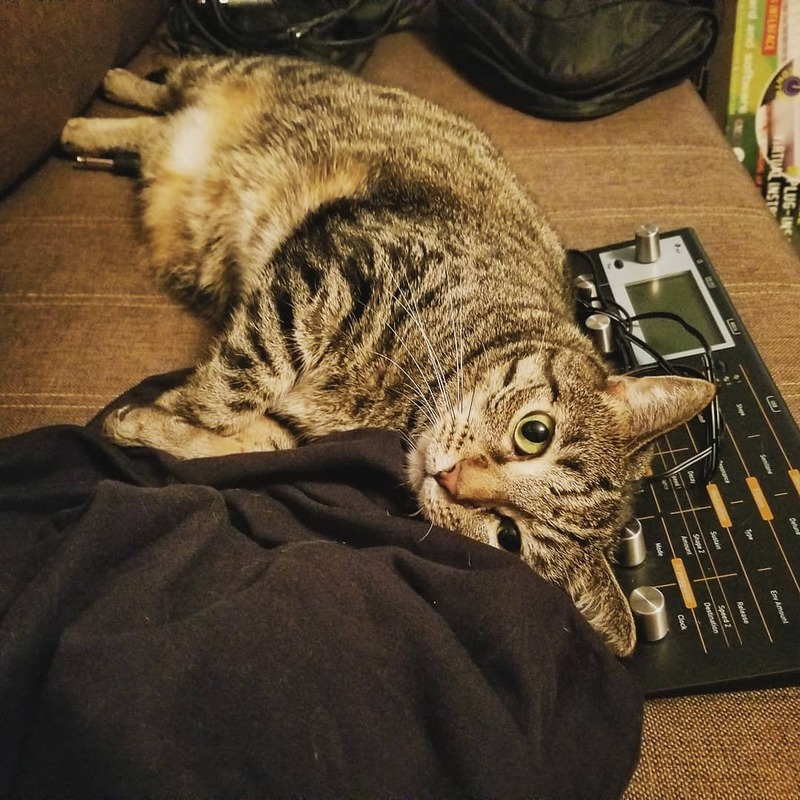 Adorable tabby cat resting next to a Waldorf Blofeld synthesizer. From flohrdumal on Instagram. White cat posing with a Waldorf Blofeld synthesizer. From Zwaren Kost in the Facebook group Synthesizer Freaks. Szarik that cat returns in this video featuring a variety of synths and vintage 1980s computers. By KATOD_music on YouTube. Submitted by KATOD via our Facebook page. In the memory of Bruce Lee… greatest dragon! My version on amazing “Enter The Dragon” theme music by Lalo Schifrin. Lead and solo parts live played on Commodore 64. The rest of tracks sequentially recorded. Video-clip recorded and assembled by Katod. From Zwaren Kost on the Facebook group Synthesizer Freaks. It was actually a response to this post. I have had the opportunity to play a Waldorf Pulse, though I couldn’t find a NAMM review of it. By Oliver M. Abplanalp from the Facebook group Synthesizer Freaks. Blofeld Day. Programming new sounds for my little synth. 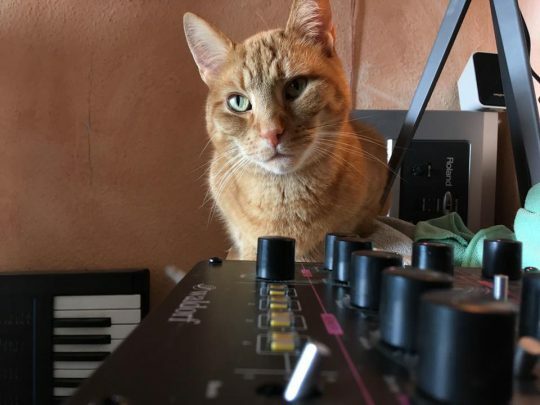 Maurice the cat sitting on a Waldorf synthesizer and showing off his Sherman Filterbank. From skaiottolo on Instagram. I have to admit I was a bit dejected at first when I started my systematic wandering of NAMM Hall A. 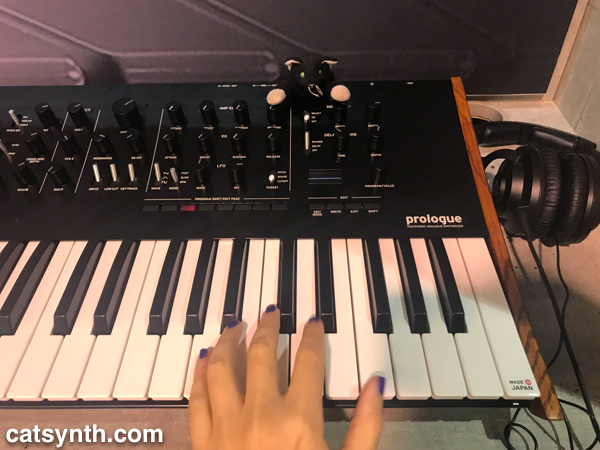 A lot of solid recording and computer gear, but one can only feign so much interest in one soft synth and digital mixer or latest incarnation of a popular digital workstation. My mood lightened when I came to the Waldorf Zarnenbourg. Yes, it is just another digital modeling synth, albeit in a pretty package reminiscent of a Rhodes suitcase piano. But it was very playable, and immediately left behind the initial overstimulation and monotony by firing up the Wurlitzer electric-piano model and playing jazz/blues/funk riffs for a few minutes. In some ways it was even more convincing than my workhorse Nord Stage (although that remains an excellent electric-piano model, too). The electric-pianos were physical modeling synths, while the acoustic piano was sample-based. The effect sections are also more versatile, in particular the auto-wah. 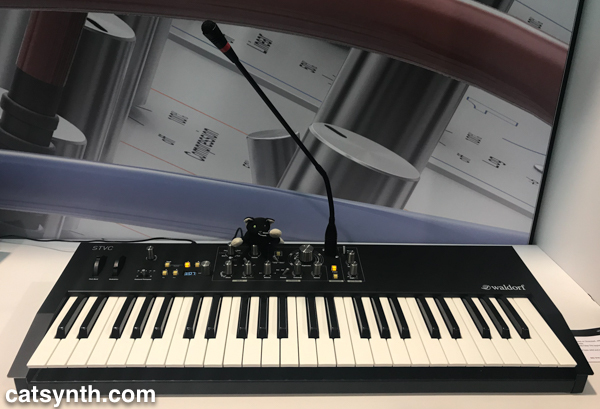 The Blofeld was connected to the Zarenbourg’s audio input so the instruments were mixed together in the piano’s built-in speakers for a fun combination of classic 70s riffing and esoteric electronic sounds. The Blofeld can get a bit intense at times, and it seems like one of the booth agents was having a little fun with the next unsuspecting soul who tried turning it on.